Let it be known that there is a plan for the construction of Stage 6 Circle Line of Keppel Port. The Singapore Land Authority together with LTA (Land Transport Authority) announced on November 6, 2013 about the project. The project is expected to conclude in 2025 and by then, all can make a complete circle when coursing through the port. 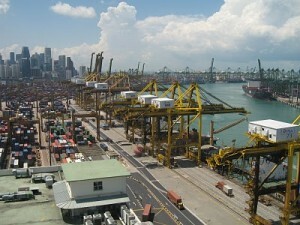 Singapore Ports again proved why they are one of the best ports in the world. The port has warehouses that can store and distribute cargoes. There are spacious yard spaces that be used for packing and consolidating. The port has special terminals that can hold oil and petroleum products. Aside from oil and petroleum products, the terminals can also hold steel and cement products. The security of the port is unparalleled. Some of the security features include 24/7 CCTV system, police force, guards, metal detectors, fencing and many more. There is also a system that efficiently tracks the movement of the containers inside the terminals. The Port has more than two hundred quay cranes that can be used by ships and their cargoes. The port also provides berths, port information and modal transport systems. Every year, many developments are undertaken. This is the effort of the Port to sustain its state of the art facilities. The Port is one of the busiest hubs around the world so it is only right to continuously improve or develop it.